I'll show you how easy it is to restore an old wood cutting board. We'll walk through how to clean a wooden cutting board, how to sanitize a wood cutting board, how to sand a wooden cutting board and how to condition and refinish a wooden cutting board. On a recent thrift store foray, when I had a list of items that I was looking for that included an old wooden cutting board…guess what I found? 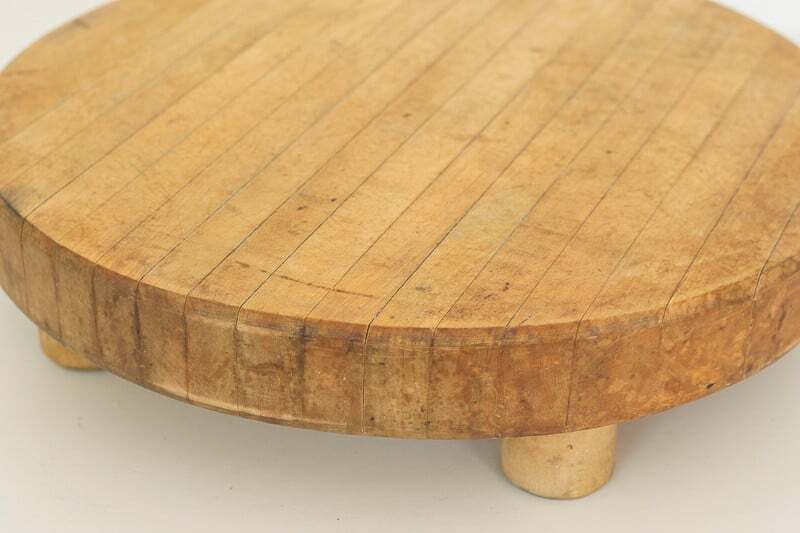 A thick , edge-grain cutting board…with feet nevertheless. With a 14″ diameter and 1 1/2″ thick, it's a great size. And it was only $10.00…that really never happens to me. It showed signs of use and was quite sticky, but I was excited to bring it home and restore it. So, how do you restore an old wood cutting board whose history you know nothing about? The first step is to sand it down. When thinking about sanding a wooden cutting board, I tought I should use a medium grit (#100) sandpaper first. Once I had all the existing finish off the top, sides and feet, I then used a fine grit (#220) sandpaper to smooth it down further. For the fine sandpaper, I used my orbital palm sander. I wasn't interested in removing all the scratches and cuts…I like the character they add. I wish you could feel it at this stage…truly felt smooth as satin. Because I didn't know the history of this cutting board a (i.e. whether it had been used to cut meat or poultry) I needed to sanitize it before I could use it. Bleach wasn't an option I wanted to use, so instead I used the less caustic hydrogen peroxide. I placed the cutting board in my sink and covered it with hydrogen peroxide and let the peroxide sit until it stopped fizzing then scrubbed the surface with a scrub brush. 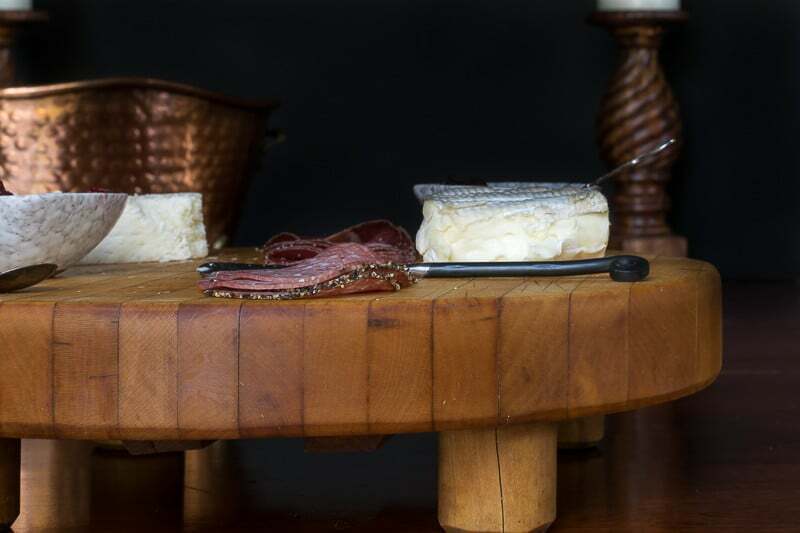 This is an important step when you restore an old wood cutting board. If you are more comfortable using bleach, I have read that you can use a diluted solution (2 TBs/gallon of water) of bleach to sanitize your wooden boards. It was interesting that each time I poured the hydrogen peroxide, it would fizz in the same area. I repeated this process until the hydrogen peroxide no longer fizzed…which was 4 times at which I was comfortable moving on to the next steps in how to sanitize the the wood cutting board. Then I poured white vinegar over the whole board and sprinkled baking soda over it. With a scrub brush I scrubbed the entire board; top, bottom and sides. I rinsed it and let it dry for 24 hours. Once it was all clean and dry, I hit it again with the orbital sander with fine sand paper. All the cleaning revealed a few areas that I missed from the initial sanding. Now for the fun part. I used some existing butcher block conditioner that I have (John Taylor Butcher Block Conditioner) and my hands and applied the conditioner over the entire board…top and bottom. The old wooden cutting board soaked up the first application of the conditioner in no time, so I repeated it again about 2 hours later and let the board sit overnight. In the morning I used a paper towel to rub off any of the conditioner that hadn't been absorbed…which wasn't much. The best way to tell if you have enough conditioner or oil on your cutting board is to drop a few drops of water on it and see if it beads up. TA DA….and that's how easy it is to restore an old wood cutting board…took me part of a day and most of that time was the cutting board soaking or drying. I may use this cutting board more as a serving piece than an actual cutting board. By the way, do you ever have just meat and cheese for dinner? It's one of our favorite meals…and a tradition on Christmas tree decorating day. We vary the meats and cheeses, but do like some sweet and savory jams with whatever we decide upon. This savory onion jam and spiced cranberry conserve are our current favorites. See that hammered copper pot in the background? It was another one of my thrift store finds…but I couldn't tell you if it was a good deal or not. Oh, I almost forgot…this cutting board has a little…something on the bottom…not sure what to call it. The only thing I can think of is that it is for a big butcher type knife. What do you think? If you love this big chunky round cutting board but haven't happened upon one in the thrift store to refurbish, I did see that you can get a new one on Amazon. How about a little before and after action! If you might want to restore an old wood cutting board, make sure you pin this image or bookmark the page for your future reference. I would say that your thrifting radar was on target with this wonderful find. I would have snatched it up also. I love that this board has feet and you can use it in so many ways besides for cutting food. Thanks for the great tutorial on how to restore a cutting board and I hope that I can find one as great as this one. Hey Sherry, coming from you that’s quite a compliment! I would still love to spend time thrifting with you…let’s plan it! Great find! I am always hesitant to buy thrift store cutting boards, for the very reason of not knowing its’ history. Surely, now that I know how to restore one, it will be months before I find one! Hey Maureen…Just a fun fact that plastic cutting boards actually hold on to bacteria more than wooden ones! There was a UC Davis research study that discovered that. And if you are nervous, then use a diluted bleach/water solution. Those old pieces just have so much more character! Great tutorial! Beautiful find! Congratulations! You make me want to go thrifting. Thanks for sharing. Hi there friend! Thanks for the kind words…and every once in a while I get lucky at a thrift store! But I’m not very consistent at browsing, think I’d have better luck if I went more regularly. Thanks for this. I’m in the mood to find a good board now. I’ve always been weary of buying a used board, and then you come along with this. I can’t wait to find one. Hey Lynne…have fun thrifting! I’m definitely going to be looking for more. It was a fun and quick project to take it from quite yucky to lovely. You make the restoring process look easy! I love how it has little legs on the bottom. Thanks for sharing. It really was so easy…rather immediate gratification…which is always good. I do love those little feet too. Thanks so much for swinging by and leaving your kind comment. I do hope you enjoy a lovely weekend my friend. Beautiful, wow you were lucky! I love that it’s so thick and is standing! It really even can be used in many ways if you, one day want to have it as a plant stand or base of a centerpiece… so many ideas! Your meat and cheese dinner looks delicious on it though and btw. we have that dinner many evenings, it’s my favourite! Have a lovely weekend Lynn! Hey there friend! I do love a meat and cheese dinner…would imagine that is rather common in Spain! I do love that cutting board…still trying to figure out where it’s going to ‘live’ in my kitchen but you are right…so many use. Lynn this is definitely a keeper. Your board and the post on how to restore it. Many times we get things and we don’t know the history so we just relegate it for other uses. I’m glad you can use this board as it was meant to be. Great find indeed! I love how you restored it. I think a huge knife for sure was placed on the bottom. Great work! What a fabulous find Lynn! And boy did it come up well!! Love it! I have an Acacia wood cutting board that I’ve had for 15 years now. The oil I got at walmart was too watery and didn’t work well. I got the butchers block oil from Ironwood ( https://www.ironwoodgourmet.com ) and it worked great for me. It brought the color of the board back. Just buy butchers block oil anywhere that’s decent. Thanks so much for your input Hermione! I do think that a good butcher block oil makes a difference…sometimes you really do get what you pay for! I don’t have an acacia wood cutting board, but they sure are beautiful. Isn’t mineral oil a good conditioner? Absolutely…mineral oil works well too!